Summer is Almost Here + Our Weekend in Asheville | Pinch. Plate. Party. It’s been quite a while since my last blog post. It’s so unfortunate because I love writing and blogging. Surprisingly the last few weeks have included a lot of writing, unfortunately the writing was all part of my classes for my graduate degree. Now that the semester is over I hope to catch up on my writing, blogging, and cooking! A few weeks ago my husband and I had a chance to get away for the weekend. I talk a lot about how crazy our life gets and how we don’t get spend quality time with each other as often as we want, so it was nice to spend some time in a new city. William is a very go with the flow type of guy so he let me plan our destination. I hadn’t been to Asheville since I was a kid, and William had never been before so of course I felt that it would be a great place to visit. Asheville, N.C. is about 3.5 hours away from Atlanta so it was far enough but not too far to tire us out for the weekend. We spend most of our weekend eating (surprise surprise) and were happy to try out new restaurants! Atlanta is a foodie city and I was excited to find that Asheville has amazing food as well. In addition to the food, it was nice to relax and enjoy the weather, the sites, and beauty in the area. 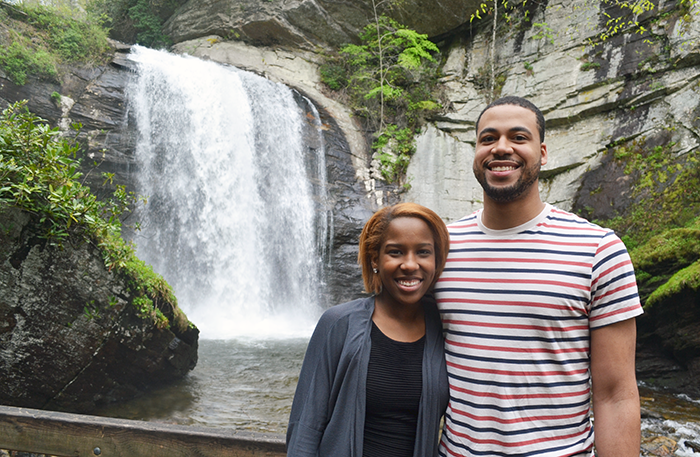 We had a chance to drive through the mountains, view some waterfalls, tour a distillery and brewery, and catch some breathtaking views of the mountains. Although the biggest attraction in Asheville is the Biltmore, we couldn’t justify spending over $100 and most of our trip just to see a house (plus I’ve seen it before). We took a fun drive through Pisgah National Forest before heading home from our trip. It’s crazy to believe that all this land (500,000 acres) was part of the Vanderbilt estate at one point. As a child, I had the pleasure of visiting Sliding Rock with my family and friends. I was determined to visit Sliding Rock again as an adult. Sliding rock is a natural water slide in the mountains that is a fun and inexpensive summer attraction. As a child the rock seemed much bigger. 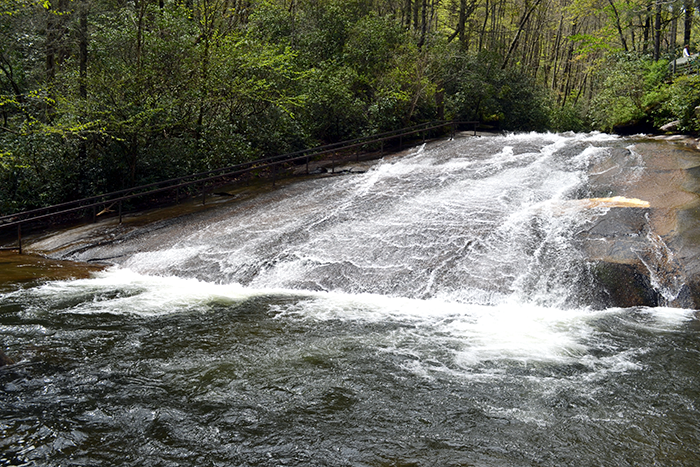 Visitors pay a small fee to park at the sliding rock area and can take turns sliding down this natural waterfall into a shallow pool of water. Because we visited toward the end of April, the water was still cold and the pool was void of visitors. I’m sure in a few weeks this spot will be full of visiting families! After a relaxing drive through Pisgah National Forest we reached the peak and were able to drive a short distance up the blue ridge parkway. 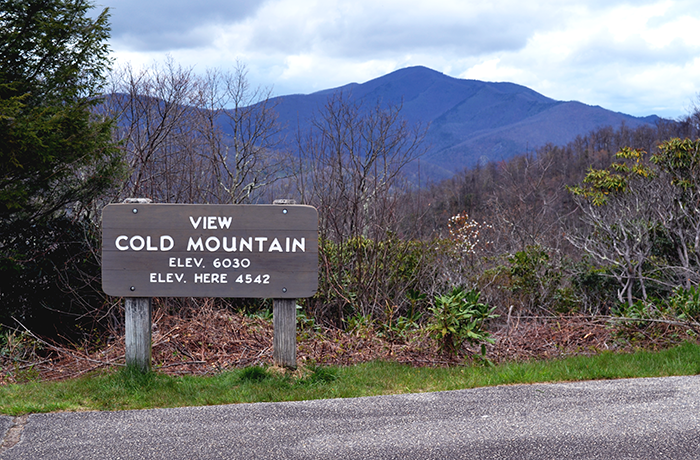 Unfortunately a section of the parkway was closed so we were forced to make a detour and head over and back down the mountain… Thankfully we still had a chance to stop and take in God’s beauty and workmanship before heading home. 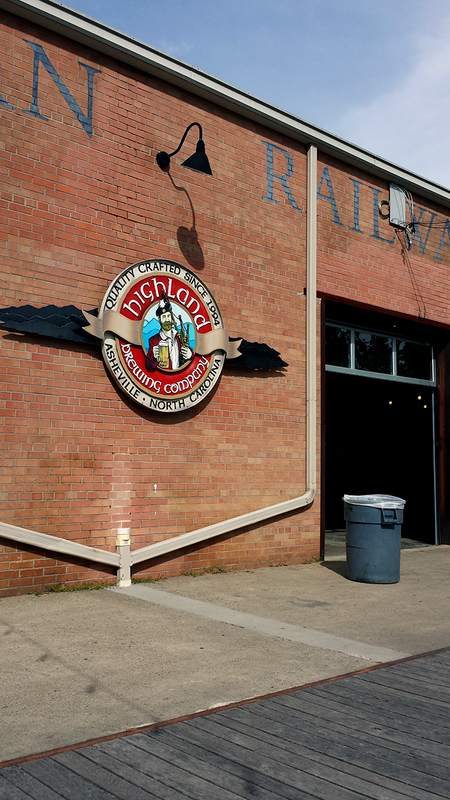 We had a chance to get a tour of the Troy and Sons distillery and visit the Highland’s Brewery next door as well. If distilleries are your thing or you’re interested in the science behind it all, it might be a fun visit! Stay tuned for my “Eating Asheville” posts over the course of the week! Next Post → Eating Asheville: Rocky’s Hot Chicken Shack — Nashville-Style Hot Chicken in N.C.